The holy month of Ramadan is full of many different traditions in every house. However, the one tradition that we all have in common is the samboosa mania that takes over the month – but it seems like each family makes it awesomely different. We at Destination Riyadh have gathered some of the most common and popular samboosa recipes so we can all get in on the delicious action and try something new! Mix the oil, flower and salt in a bowl until the oil disappears. Then gradually add the warm water to the mix until the dough is created. Form dough balls in the size of your choice then place them in a tray. Cover the tray with a plastic wrap and leave for two hours. Take your minced beef out of the freezer the night before to defrost gradually. Place the beef in a pan with 1 medium sized chopped onion, sprinkle some salt to taste and fry it on medium heat until brown and onions are translucent. Then store it to the side until ready to stuff. Spread each dough ball using a dough roller, place about a teaspoon of stuffing, whether it’s simply cheese or minced beef in the middle of the dough as your stuffing. Once you stuff each samboosa, seal it into the shape desired using a little bit of flour to stick the ends well together. Fry each samboosa with some vegetable oil until golden yellow. Peel and cut potatoes to 1cm cubes and set aside. In a deep pan, heat vegetable oil, add potato cubes and fry until golden, then remove and set aside. In the same pan brown minced meat, add chopped onions and fry until onions are translucent. Add chopped parsley and the Maggi Chicken Bouillon and water and simmer for five minutes until liquid is absorbed. Stir in previously fried potatoes and remove the filling from heat, cover and then cool down to room temperature. Dissolve corn flour and cold water until smooth and milky. Place about a tablespoon of the filling on the samboosa pastry and roll to desired shape, making sure the filling is completely covered. Brush with the cornstarch mixture to seal the ends of the pastry. Pan fry rolled samboosa in hot vegetable oil and place on kitchen paper to drain excess grease. Serve warm with a side of chili sauce. A mix of white French cheese and white Hungary cheese. Mix the ingredients in a bowl until made into dough. Create balls of dough and leave to breathe for about 15 minutes. Flatten each ball, and stuff it with the cheese mix. Moisten the edges, fold each ball into a half moon shape and press together to seal tight. Mix the flour, butter, oil and salt in a bowl, then add water. Mix the ingredients well until strong dough is formed. Cover and leave for an hour to rest. Chop the spinach to medium sized pieces. Pour the water into a pan and boil it, then add spinach and a dash of salt. Boil the spinach for four minutes then rinse it immediately using a strainer and place it in a bowl with ice water to preserve it’s color. Then rinse the spinach well of the water. Pour the oil in the frying pan, add the onion and a dash of salt, stir the onions on low heat until they become transparent. Then add the garlic and spinach and cook all together. Season with the mix of salt and pepper. Leave the spinach mix to cool down. Mix in the lemon juice with the sumac to add flavor then the toasted pine nuts are added. Cut each piece of dough using a circular template, and place one teaspoon of stuffing inside each circle. Then fold into a pyramid shape and seal well. Cover the dough and leave to breathe in the fridge, then it’s ready to fry. To serve, fry the samboosa in hot oil and serve immediately. Add the ingredients one by one. Prepare the seasoning in the meantime. Quickly roast the onions in a pan with the olive oil. Start seasoning with the salt, pepper, cumin, ginger, lemon and green pepper. Add the chicken broth after well seasoned. Add the sumac at the very end. Leave to cool down in another pot for about half an hour. Flatten the dough balls and stuff each one with the chicken mix, then fold and seal into the desired shape. Moisten the edges to seal well. Place all the samboosa in a tray. Mix of 1 egg yolk, 1 tbsp milk and 1 tbsp vegetable oil and spread on top of each samboosa to give it something extra. Place in the oven for about 20 minutes; check on it every few minutes until golden brown. Defrost the samboosa sheets the night before. Take out one by one and stuff with one cheese square per sheet. 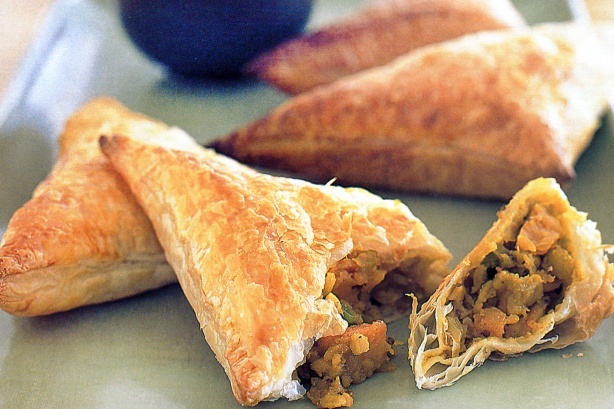 Fold into a samboosa triangle. Seal using the help of the flour and water mix. Fry all the sealed samboosa’s in a pan with deep hot vegetable oil until golden yellow. Using a strainer, drip out the water from the samboosa. Dip each one into a bowl of sugar syrup.